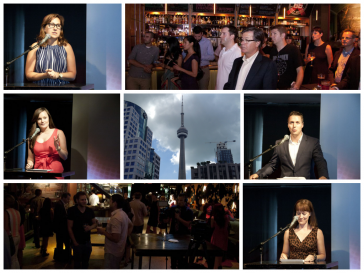 Behind the scenes at Reboot last week saw the whole team focused on the media reception in Toronto July 11th, for the launch of the 2014 Canadian Videogame Awards. Coming straight off of our Healthcare conference at the end of June in Kelowna, this gave us just 6 business days to finalize all the details. Our Toronto committee was invaluable in reaching out to the studios and media to secure their attendance at the launch. Our new Communications Co-ordinator Leslie McGuire (Vancouver) arranged all the logistical details with the Drake Hotel, from food and beverage, to venue access to audio visual – and the venue turned out to be fantastic. Our partners over at Greedy Productions cut an entire promo video for us in less than 48 hours, and our amazing graphic artist Kathrin Smith (Calgary) produced an entire press kit for us. The folks at ESAC even translated the press release I wrote within 24 hours. Director of Business Development, Nicole Emmett (Ottawa) co-ordinated our Toronto meetings, liaised with the mayor’s office, sat with me in a hotel room the night before the launch assembling media kits, and on a last minute suggestion of our CEO, Greg Spievak (Victoria), even took on the roll of Master of Ceremonies for the launch itself. Nicole, Greg and I all did interviews with the press after the launch as well. As you can see from the media uptake – a fine time was had by all, (http://www.canadianvideogameawards.com/press-room/). As I am also based in Victoria, there is not one of us who is actually working in Toronto – but that did not stop this virtual team from coming together to successfully launch the 2014 CVAs. That’s the way to get this party started – thank you team!